It was 2:35 in the morning when I had last looked at the clock. I was sitting on the refreshingly cool concrete basement floor at Hadley Road’s floral studio tying knots in an attempt to macrame hanging flower baskets for our styled Minnesota wedding photoshoot that started in 5.5 hours at 8am. I had never done macrame in my life. As we sat there, pumping ourselves with caffeine after already working a whole day to make up for lost time and finish our projects, we laughed through tears when Emily, Hadley Road’s owner asked me where I learned to macrame as she put together one of the most gorgeous bridal bouquets I have ever laid my eyes upon (pictured below). Below are the hanging baskets Emily and I created at 3AM the night before our styled photoshoot (we think they turned out pretty good)! That weekend was when I knew that not only was Hadley Road a name for an amazing stylist’s talent, but that the woman behind Hadley Road, Emily, was a person with a genuine heart, a sense of humor that doesn’t stop, an incredible drive for what she loves and a talent that is unparalleled. And I knew I had to tell our clients and our friends about her. As she explains it, her grandmother very much had a green thumb and tended to an extravagant flower garden. When her grandmother passed, she was able to split some of her grandmother’s favorite flowers and plant them in her own garden. 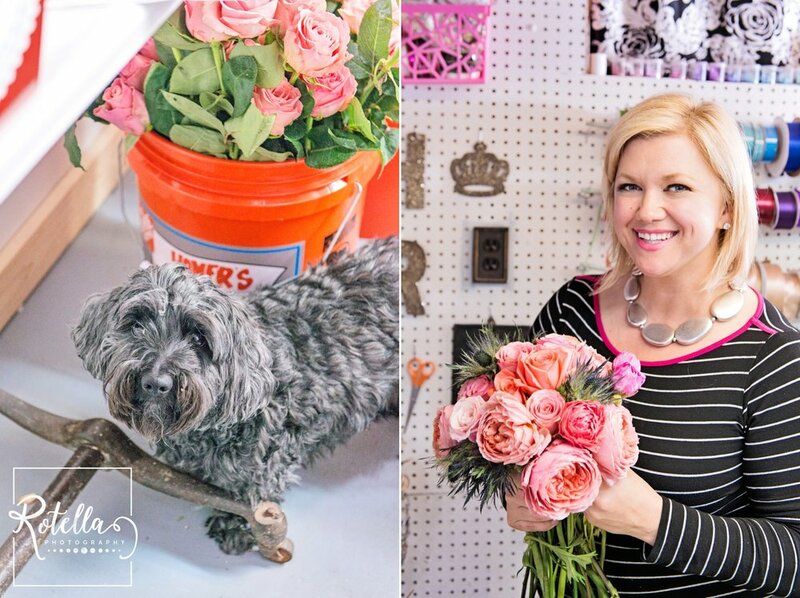 Even her studio when she is building floral arrangements is gorgeous! From Peonies to roses to ranunculus, no matter what story Emily tells, I know the truth. She has a passion that runs deep for things with natural beauty. Emily started creating exquisite floral arrangements for her own wedding and then expanded to helping family and friends with theirs. She now has a passion for helping every single bride and groom she works with express their love through color and style on their wedding day. Are Wedding Flowers Still On Your List of To-Do's? As your Minnesota wedding photographer, we are the only vendor that is with you throughout your entire wedding day. On top of that, we are one of the first vendors that is booked for a wedding and so we have visibility into the entire wedding planning process. For that reason, we are many times asked for referrals for this and that if our brides and grooms do not already have someone in mind. Hands-down, every single time we are asked or will be asked to recommend a planner, stylist or florist, our answer will be Emily at Hadley Road. Check out her portfolio on Facebook or her website. To get in touch, shoot her an email (hadley.road@yahoo.com) and don’t forget to tell her we sent you! And receive a free bridal bouquet with any floral or styling package with Hadley Road over $700!